Congratulations to the Club Ed runners who completed their first Avalon 50 ultra marathon. 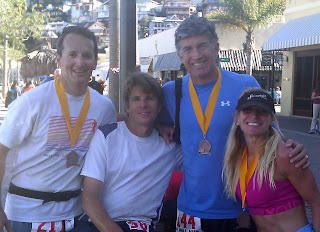 Jeff, Will, Will and Annie pictured above all were tired but amazed at their sense of accomplishments. I think the consensus amongst the group was that the double marathon was an amazing experience & experiment of what the body is capable of doing if properly fed and hydrated. Don't be surprised to see all of us coming back in 2012 and hopefully with some other Club Ed runners who want to take the challenge. Ironically, the biggest challenge of the race was running downhill and not the 8,000 feet of climbing along the course. Towards the end of the race I found myself praying for more uphill sections so I could take a break and walk. Just ask anyone about the last 4 miles that dropped from 1,500 feet to sea level on a road. It felt like my quads were getting clubbed with every step and are still very sore as of Wednesday 4 days after the race. There were 241 masochists in the race: 175 men and 66 very fast women. The well organized race was held in the beautiful Catalina mountains that had an elevation gain of 8,000 feet along 50 miles. The race started early at 5am in Avalon and the temperate was a balmy 60 degrees and turned around in Two Harbors. Temperatures climbed to about 82 degrees by mid-morning and racers could not drink enough water between water stops to stay hydrated. Most runners carried food, electrolytes and 20 to 48 ounces of water between water stops that were spaced 4-8 miles apart. Here were the results form the group . . .
Will Longyear took 19th place overall and ran it in an amazing 8 hrs 31 minutes (avg 10:14 / min miles). Will will tell you a great story about getting dropped at mile 45 after running most of the race with Juliet Morgan (not in Club Ed but should be). Annie Seawright broke 9 hours and finished in 30th place overall and ran 8:58. She was the 6th woman to finish in a very strong field. If you look at her times she actually gets stronger after the first marathon at mile 26 to the finish. She dropped in me at mile 25. Will Weston and Jeff Cohn (me) managed to stay in the top 20% of the field finishing 47th and 48th. We met at Pumphouse hill and finished together in 9 hours 24 min. Amy Micheletti who has run with Club Ed in the past had a great day running in 9 hrs 54 minutes and managed to drop her training partners (men) as well. Enjoy this race video of our day . . .